How is it already the last day of February? How is Will 1.5 months away from turning ONE? Am I the only one that feels like this year is absolutely flying by? Since it's the last day of February, it is time for yet another accountability post to check on the status of my 2013 Goals! Um, well. I didn't do so good. We've all been sick (including me - stomach virus and kidney infection all within a week). March has got to be better! I feel so much better when I write and document and get my feelings out! I also know that out family members enjoy frequent updates and pictures of the kids! I may have failed for February but I've still got time to make it up this year! I've done ok with packing Alex's lunches, could be better but also could be worse! I actually left the house by myself several times this month. Yes one of those times may have been for a doctor's appointment when I felt like I was dying (thanks kidney infection) but alone is alone. Right mommas? Beggars can't be choosers! Kate and Will also both had one on one time with each parent this month! Again, my time with Will may have been spent at Texas Children's while Alex and Kate were on a fun daddy daughter date. However, when I have just one child with me at appointments I can do things like cuddle Will while we wait verses keeping him in the stroller as I attempt to entertain his big sister! One thing I have really focused on this month is arts and craft time with Kate. We typically do this during Will's morning nap and she absolutely loves it! Kate is so creative and loves making things! She gets so excited when Alex gets home and she can show him her craft! I am not a creative person by nature so this has taken some planning on my part but it is totally worth it! So I'd say I rocked this category this month! Another category I did very well in this month! I pulled my camera out about 12 times this month and took tons of pictures that I just adore! Including some precious "I escaped mid diaper change and am going to sit on the floor naked and play with my toys" pictures of Will! There is just something undeniably cute about a chubby baby booty and baby thigh rolls! I probably won't post these on the blog (thanks for ruining things creepers) but trust me, they are precious! I also had an impromptu photo shoot with Kate and her best BMT buddy Colt! 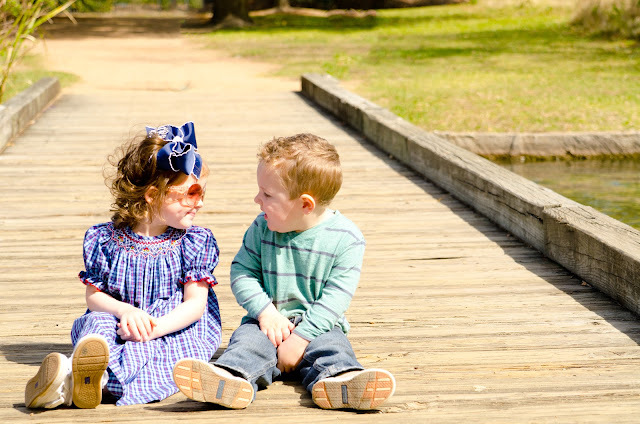 Natalie and I took the kids to Herman Park to feed the ducks and I captured some precious images of these two miracles! I mean how stinkin cute is this?!?! As far as Photoshop goes I have taken some time to learn more of the design aspect and have created several printables! As I mentioned in my last post I am selling the Family name/ State printables and I have a scripture printable that I will be sharing (for free!) soon. 10.5 books completed this month for a total of 18 books read so far this year. This category proves my level of book nerd! I am confident that I will hit my goal of 50 books by May or June. One thing I've learned this month? I tend to find a genre/ author and read it to death then move on (hence me reading every.single Harlequin Kiss book that was published in February). I also like series. I feel like I am in a book rut and haven't read anything that I just LOVED since finishing The Caster Chronicles earlier this month. Hopefully I'll stumble across some wonderful books soon! I am apart of an on-line based book group and I am really enjoying it. I loved being forced outside of my reading norm and love discussing what I read with others! Best part? I can participate while sitting on my couch in jammies sans make-up! The biggest problem with my speed reader status? I can easily drop $150 on books in a month which is INSANE. There is too much instant gratification with the Kindle and Amazon and I quickly fall victim to the "one click purchase" trap. Because of this I am challenging myself to "shop my Kindle" during the month of March. I often buy books that are "daily deals" simply because they sound kind of interesting and are cheap. Then I forget about them and never read them. I've probably got 25-30 books on my Kindle I have never read. So I am challenging myself to read what I've already purchased during the month of March! Anyone else keeping track of their 2013 goals? I'd love to follow your progress and send encouragement your way! I think I'm going to try what you're doing during March: shop my bookcase/Kindle! I have so many books I've bought or been given and haven't gotten around to reading. I want to make sure I get to those at some point! Look at all of Kate's hair!!! She looks like the cutest little girl in this photo. I've got to do better about getting my real camera out too!